Although an HTML5 web developer can suggest any font for a web page, the font files are traditionally a client-level asset. If the client doesn’t have the font installed, she won’t see it. Fortunately, CSS3 supports a sensible solution for providing downloadable fonts. The style does not work like most CSS elements. It doesn’t apply markup to some part of the page. Instead, it defines a new CSS value that can be used in other markup. Specifically, it allows you to place a font file on your server and define a font family using that font. TTF: The standard TrueType format is well-supported, but not by all browsers. Many open-source fonts are available in this format. OTF: This is similar to TTF, but is a truly open standard, so it is preferred by those who are interested in open standards. It is supported by most browsers except IE. WOFF: WOFF is a proposed standard format currently supported by Firefox. Microsoft has hinted at supporting this format in IE. EOT: This is Microsoft’s proprietary embedded font format. 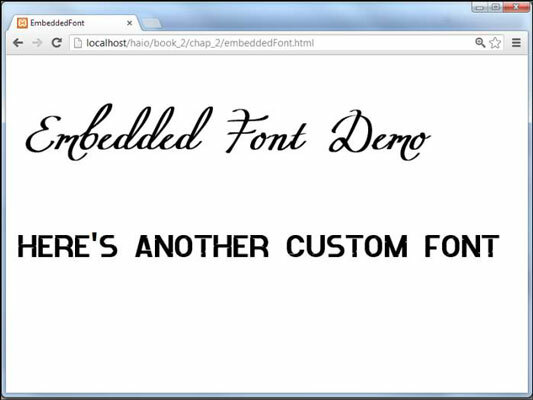 It only works in IE, but to be fair, Microsoft has had embedded font support for many years. You can use a font conversion tool like onlinefontconverter.com/ to convert to whatever font format you prefer. It’s possible to supply multiple src attributes. This way, you can include both an EOT and OTF version of a font so that it will work on a wide variety of browsers. When you use this technique, you need to have a copy of the font file locally. It should be in the same directory as your web page. When you begin hosting on a web server, you’ll want to move your font file to the server along with all the other resources your web page needs. Just because you can include a font doesn’t mean you should. Think carefully about readability. Also, be respectful of intellectual property. Fortunately there are many excellent free open-source fonts available. Begin by looking at Open Font Library. Google Fonts is another great resource for free fonts. With the Google Font tool, you can select a font embedded on Google’s servers, and you can copy code that makes the font available without downloading.